Contact your local KRG Representation in Austria for start-up information and contacts. If you are operating in a neighboring country where no representation has been established (Czech Republic, Slovakia, Hungary, Slovenia), the KRG Representation in Austria will gladly assist you. Talk to current investors in the Region and learn about their experiences. The Kurdistan Regional Government Representation will gladly establish the contact for you. As personal business relationships are important to start business in the Kurdistan Region, it is beneficial to take a personal trip or to join a business delegation to the Region. A visit to the annual Erbil International Fair is also very rewarding. The KRG Representation in Austria will advise you on how best to organize your trip and provide you with the necessary contacts. You can also submit your investment proposal to the Board of Investment. Both, the BOI and the KRG Representation will assist you in preparing your proposal as well as the supplementary documents. The internationally renowned consulting and auditing firm Deloitte has published a start-up guide for the Kurdistan Region. 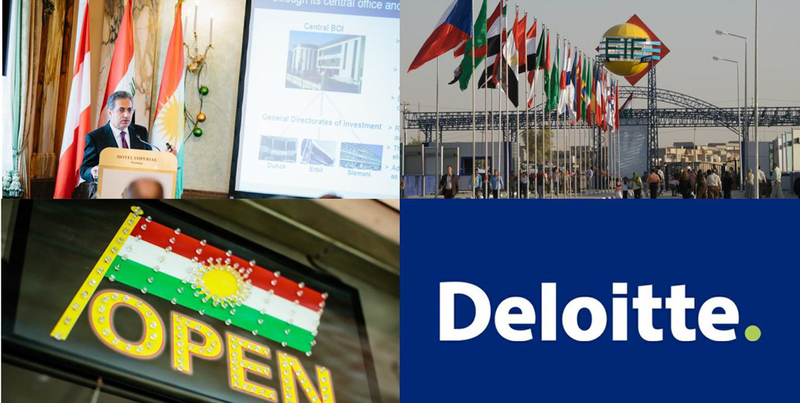 Deloitte is already present in Erbil with a branch office, and is now looking to assist other interested companies in seizing business opportunities in the Kurdistan Region. In its guide, Deloitte provides detailed information about the registration of new companies, taxation, funding, and accounting requirements. Below you will find an overview of the contents of the guide, as well as links to the full versions of all chapters. As a general rule, a foreign company that is “carrying on business” in the Kurdistan Region is required to establish a legal presence in the Region (e.g. company, branch office, etc). While there is no specific definition as to what constitutes “carrying on business”, typically an obligation would arise when the company obtains premises (including rented premises) in the Kurdistan Region, or retains personnel on a more than temporary basis. Iraq’s Companies Law 21 (of 1997) as amended in 2004, which is adhered to in Kurdistan allows for several types of legal business structures. Principally these include joint stock companies, limited liability companies, joint liability companies, sole proprietorships, and branch offices. As a semi-autonomous Region, the Kurdistan Region has introduced certain tax laws and practices that diverge from the position in Federal Iraq. This section discusses corporate income tax; including issues such as compliance, income tax rate, and loss carry forwards. Transfer pricing, capital gains, withholding tax, employment tax, social security contributions, VAT/sales tax and import, export and customs duties are also discussed. Law No 4 of 2006, Law of Investment in the Kurdistan Region (the “Investment Law”) provides for tax incentives and exemptions for foreign investors in the Kurdistan Region who are involved in certain qualifying projects. The Investment Law sets out specific sectors which are considered to fall within the scope of the Investment Law. In general, projects involving vital sectors, such as electricity, agriculture, health and environment, infrastructure and education, etc qualify as eligible projects. There is a requirement for Iraqi entities to submit annual audited financial statements to the Companies Registrar and General Commission for Taxation. The financial statements must be in Arabic and in accordance with Iraq’s Unified Accounting System “IUAS”. Strictly, Iraqi corporate law requires that Iraqi entities maintain Arabic accounting books and records inside Iraq.